Holland’s skillful avoidance of repeating Richards’ more famous lines invites her audience into a more intimate relationship with the glorious essence of Ann, and brings them face to face with her complex, colorful, wise and captivating brilliance and love of life. 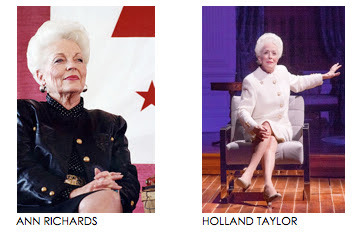 Though I never met Ann Richards, I was a fan, so I was able to grasp how fully Holland (who is a friend of mine) is able to transcend her own powerful being and become Ann. Ann is an inspiring, hilarious, beautifully crafted tour de force. It's playing in New York City at Lincoln Center's Vivian Beaumont Theater through September 1st, and is a must-see. For tickets, visit www.telecharge.com or call 212-239-6200. And there’s more! Imagine what an honor to Ann Richards a US Postal Service commemorative stamp would be. The proposal for the stamp was officially submitted in mid-January, along with a listing of the impressive committee in support of the effort (click to view). The stamp is now officially in consideration by the Citizens’ Stamp Advisory Committee. Our next step is to demonstrate support for the stamp from the general public, so please add your own signature to those of the artists, media minds, thinkers, interested citizens and activists who’ve already signed the petition on Change.org by clicking here. You can also 'like' the cause on Facebook and follow it on Twitter. 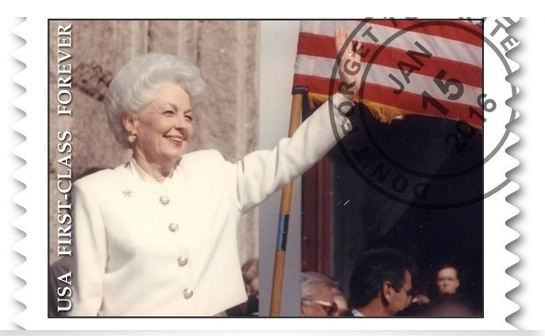 Thanks for helping to honor Ann Richards.